Synopsis: Marvel’s Thor: The Dark World continues the big-screen adventures of Thor, the Mighty Avenger, as he battles to save Earth and all the Nine Realms from a shadowy enemy that predates the universe itself. In the aftermath of Marvel’s Thor and Marvel’s The Avengers, Thor fights to restore order across the cosmos…but an ancient race led by the vengeful Malekith returns to plunge the universe back into darkness. To defeat an enemy that even Odin and Asgard cannot withstand, Thor sets upon his most dangerous and personal journey yet, forced into an alliance with the treacherous Loki to save not only his people and those he loves…but our universe itself. The Marvel movie universe is in no short supply of content, and it continues to churn out sequel after sequel of its mainstay properties, namely The Avengers, Iron Man, Captain America, and Thor. New characters will also get their time in the spotlight; cue the upcoming Ant-Man. Sequels are always a difficult prospect, made even more difficult when a storyline must follow its own first film and a compilation movie wherein the main character appeared, as did the villain. This difficult feat begins with the release of Thor: The Dark World, where the story has to continue from Thor and The Avengers, while also creating a new antagonist for the Godly hero to battle. Thor: The Dark World manages to bridge everything together, maintaining continuity from the previous films, and also establishes a new enemy and mythos. While the mythos makes sense, it is the structure and pacing of Thor: The Dark World, along with creative choices for character usage, that inevitably becomes its downside, even as it remains engaging entertainment from start to finish. It has been two years since Thor (Chris Hemsworth) first stepped foot on earth’s soil, and fell in love with scientist Jane Foster (Natalie Portman from Black Swan). Thor returned to join the Avengers battle it out against his own brother, Loki, and a gang of aliens in New York City but Jane was nowhere to be found during that visit. Well, she is in Thor: The Dark World, and audiences just may groan over the fact. Thor is a love-sick puppy for most of the beginning of Thor: The Dark World, even amidst the drama with Loki (Tom Hiddleston) being placed in an Asgard prison, and the fighting occurring in the realms that he must relinquish. At the end of the day, when everyone is celebrating yet another victory, Thor sits in a melancholy state, without even the energy to toss his glass on the ground and ask for another drink. Jane meanwhile is in London, chasing scientific anomalies that may lead her back to Thor; or they just may get her in a ton of trouble when she comes in contact with the Ether. The Ether is the ultimate weapon and dark power force. It has been around for centuries, existing as a fluid ever-changing substance that resembles molten silver, with red highlights, that hovers in the air, expanding and contracting, searching for a host. 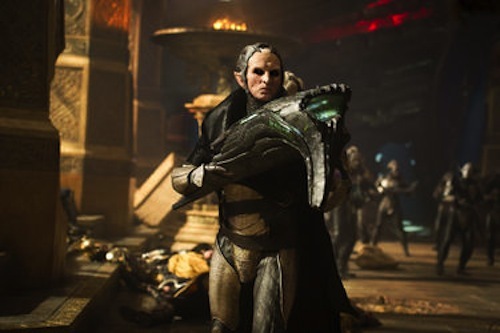 The host was previously the Dark Elf Malekith, who has since been thought to be dead and the Ether hid away, never to be found again. Or so King Odin’s (Anthony Hopkins) father believed. The realms are all aligning. for the first time in hundreds of years, and this is causing wormholes of sorts between realms. What better way to solve the problem of getting Jane to Asgard than to have her fall into a wormhole, come in contact with the Ether, and need to be protected by Thor himself? It sounds perfect, until its executed on screen. Thor has his mission, to battle Malekith and save Asgard, and all of the realms, from ultimate destruction. Jane’s role in all of this is to stand around and occasionally shock someone who touches her as the Ether is a strong force. It will be an easy thing to do as to compare Portman’s performance as Jane to that of her as Padme Amidala in the Star Wars prequels–and this is not a compliment. The blank stare, occasional movement of facial features, and complete lack of real emotion most of the time makes for a very stale performance and unnecessary character. Using Jane as the central force that leads Thor on his quest against the Dark Elves is merely an excuse to have her in the movie at all, and she need not have been. For a central character to the story she is given little if nothing to do, and therefore only distracts the viewer from the real action. Thor’s time is better spent on the battlefield, not kissing Jane on a balcony right before all hell breaks loose in the Asgard prison due to a bull-man gone mad. With Thor: The Dark World the saving grace, to say the least, is the character Loki, and the always outstanding performance of Tom Hiddleston. Loki is full of his sarcastic wit and dry humor in Thor: The Dark World, even as he is trapped in prison. The channeling of Jim Morrison’s hair is also a welcome treat, once the facade is stripped away. Loki is the character to love in the Thor universe, for all of his evil intentions and yet wholly likable energy for being so bad, and Thor is a hero you like. 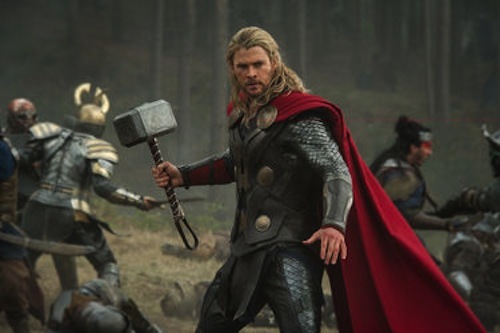 Thor may do a great deal of good in Thor: The Dark World, keeping the action scenes pumping along with his hammer skills and great one-liners, but without Loki chiming it at the end to help the movie would be skippable, as difficult that statement is to make because this is Thor, after all. Managing to get through the first act, and part of the second will prove easy but not excessively so for viewers of Thor: The Dark World. Once a pivotal death scene occurs (no spoiler here), the action amps up, Loki and Thor are together again, and everything gets a great deal better for the story overall. Trying to get past why Erik Selvig (Stellan Skarsgard) has been turned into a naked buffoon running around Stonehenge is something unexplainable, but its all made up for with an impromptu cameo by an Avenger, that makes for a great big chuckle. Thor: The Dark World may have structural issues, not knowing exactly what the exact goal is until halfway through the movie, but its still an enjoyable time at the movies. Things could be a great deal worse, so being thankful its entertaining, has plenty of action, and enough humor to sustain you is more than enough to warrant a trip to the theatre. Thor: The Dark World is packed full of action sequences, and to a viewer’s delight they primarily take place on other worlds in the nine realms. This is a nice change of pace from the original Thor, having taken place on earth, and The Avengers, also on earth and seriously lacking in the action department creatively. There is no lack of creativity when it comes to action in Thor: The Dark World. The opening of the film drops the viewer straight into the action, and there are numerous occasions at which to delight in battle, be it on the ground or in the sky, throughout the movie. By placing the action on new, unknown worlds, the opportunities abound for production and costume design. This gives the viewer more than just action to feast their eyes upon but scenery at which to look and admire, while Thor and his Asgardians fight to restore balance. On the ground is a rock monster that resembles a well-known character from The Neverending Story, while in the sky the elves are having fun wreaking havoc on Asgard. It is here that the similarities between Star Wars battle scenes and those created herein will have your mind whirling–all while Asgard is being demolished. Pleasure can be found in the action sequences of Thor: The Dark World; Heimdall (Idris Elba) finally gets to have some fun, and what fun it is to see him in action. Thor: The Dark World may have problems overall, but the action sequences are indisputably well-done, right down to the wormhole battle finale that will have you wishing there was more fun to be had battling between worlds.